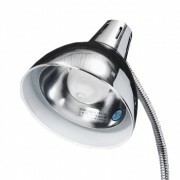 Flexible goose-neck arm with 360° adjustable steel shade. Adjustable height range: 50" to 74". Chrome-plated, weighted steel 11" diameter base. Uses up to a 60 watt incandescent bulb (not included). UL approved lamp and cord. Grounded three-prong cord. Inner/outer cool shade system.